This manual documents the 0.80 release of the pxc device driver and associated user utilities, the driver works with the PXC200 frame grabber produced by ImageNation. Version 0.27 and later of the driver work with both the "F" and "L" variants of the grabber. Version 0.28 and later also work with generic Bt848/849/878 devices. Version 0.80 and later also support the PXC200A (both "F" and "L") family of grabbers by ImageNation. The pxc package is made up of a device driver implementing read and ioctl operations and a few user-space demonstration applications. The sample applications are also used by the author in the real world, especially in relation to the bisce package (http://arcana.linux.it/software/bisce). Acquisition of sequences has been disabled with the introduction of buffer management. I plan to reintroduce it implemented in the right way. I don't think this affects you unless you are running something like bisce (http://ar.linux.it/software/#bisce). This driver works with Linux-2.2 and 2.4. Support for 2.0 has been removed after version 0.28 As for 2.0, I didn't remove the portability code from the source files, if the need arises I might backport the features of Linux-2.2 I have been using after release 0.28 of this driver. Basically, the driver creates a few streams that can be used to retrieve image data. The devices are created for four grabbers; if you have more devices, you need to create the nodes for them in /dev (there are no limits in the driver, as allocation of data structures is dynamic). The pgm device associated to the previous one. When being read, it returns a single pgm image, in low resolution. You can just invoke "display /pxc0pgm", or anything equivalent, to preview your data. Once again, DMA is needed to use this device. By default, DMA is stopped as soon as one field has been acquired. In version 0.27 and earlier of the driver, the driver continued overwriting the DMA buffer with new images; therefore you could get slices of different images if reading slowly. Anyway, you can set PX_FLAG_CONTACQ if you need continuous acquisition. Color "portable pixmap" devices, similar in concept to the pgm entry points. The require a DMA buffer. Only one field or one frame is acquired. The pll argument is used to tell which of the devices has a single quartz crystal and needs use of the internal Bt848A phased locked loop (PLL) to generate a PAL frequency. 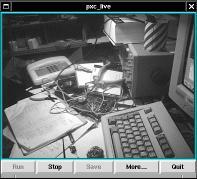 The PXC device by ImageNation have two crystals, but some other Bt848-based device requires the PLL to be used (if images grabbed from PAL cameras have misaligned lines, then you need the PLL). For example, to use a real PXC200 (/dev/pxc0) and a plain-Bt848 device (/dev/pxc1 I use the parameter "pll=0,1". The PLL is automatically used for any device based on the Bt849 and Bt878 chips. The buffers argument default to 2, and is used to select the behaviour in buffer management. If you have reserved enough memory you are strongly urged to use buffers=3. See Buffer Management. Up to version 0.28, I used a single image buffer for each frame grabber device. This lead to several problems, related with DMA going on at the same time as a user space program is reading the buffer. The driver allocates space for two buffers by default, although for best operation you'll need three or more buffers. The default can be changed by setting the buffers option when loading the driver, so you can choose to always allocate three buffers if this best suites your application (see Loading). I chose to keep the default smaller in order to avoid "not enough memory" errors with setups that worked well with older versions of the driver. The current implementation of the driver refuses to run with less than two buffers, because that environment would require to start and stop DMA according to use of the buffer, and I'd better avoid it if possible. Each of the buffers is either in-use of free. A buffer can be used by either the device driver or a user-space process. The driver owns a buffer when the frame grabber is actively writing to its memory area, a process owns a buffer when it is reading data from it. In general, you'll need R+W+1 buffers, where "W" is the number of writers (in this case, 1), and "R" is the number of readers (the number of processes that need to access image data). The case with several processes has not yet been tested, though, and the current design doesn't allow more than one process waiting for a new buffer; some issues still need to be addresses, but it's a low priority task. Currently, only one process (rather, one file) can be waiting for image data, if another file should wait it will receive EBUSY ("Device Busy") instead. The source package of the device driver includes a few demonstration source files. All of them are called demo-* and they are well commented. If you make them save image data to disk, the output files are all pgm images or ppm if you are acquiring color images. Those demonstration programs are not installed by "make install". A device driver is plugged in the system by means of a table of "device operations" (or methods) that is takes care of. The implementation (or lack of) used in the pxc grabber is described below. The open method allocates resources. On first open the device is initialized and its DMA engine is programmed for correct operation. Since high resolution (frame acquisition) and low resolution (field acquisition) use different DMA programs, they are incompatible; i.e., opening a high-resolution device will return EBUSY ("device busy") if a low-resolution device is currently open. The same incompatibility exists for color vs. B/W mode. Retrieves the reference voltage set in the DAC chip. This defaults to 128 at initialization time (i.e., 1.25 volts). Set the reference voltage value: the voltage is used by the By848 to scale video samples. The PXC200 generates the reference using an 8-bit DAC powered by a 2.5V voltage reference. This command is considered obsolete, I plan to remove it in the future as buffer management has been introduced, and it offers much better performance. The command can return -ENOMEM if the requested buffer cannot be allocated. If this ioctl() returns success, successive read() calls will read from the allocated buffer instead of the current acquired image. This effectively allows to read a sequence of evenly-spaced images to user space. Data being read will always be in raw format, independently of whether you are reading the pgm or non-pgm device node. When every field has been transferred to user space, the reader will se EOF. These commands get/set the number of brightness value. Brightness value for bt848 device ranges from -128 to 127 and 0 is the default value. These commands get/set the number of contrast value. Contrast value for bt848 device ranges from 0 to 511 and 216 is the default value. These commands get/set the number of hue value. Hue value for bt848 device ranges from -128 to 127 and 0 is the default value. These commands get/set the number of chroma (u) value. Chroma (U) value for bt848 device ranges from 0 to 511 and 254 is the default value. These commands get/set the number of chroma (v) value. Chroma (V) value for bt848 device ranges from 0 to 511 and 180 is the default value. Some features are missing. Some of them are just "not yet" features, and some are missing by design - i.e., I have no plans to implement them in the near future, unless someone shows interest in them. This section describes only those kind of deficiencies (or ideas that are not scheduled to be implemented). Its main window is similar to pxc_live, the simple live-video and save-one application. In addition to pxc_live, pxc_xgrab has an "Extra..." button to open a control window. This document only deals with the control window, as the main window is definitely plain and self-explanatory. The control window has a different look according to whether the program is running under Pacco or under a plain wish. When running under Pacco the program offers image operations (background subtraction, gain, offset), displaying at half size (faster), and a "save settings"/"load settings" functionality. Other features are available in both cases, and the following description applies to the Pacco case. Please note that when the user acts on the scale to change the width of the low-pass filter, the background is not immediately updated; you need to press the "Subtract" button in order to update the background. If you want to see what the calculated background looks like, you can use the "See background..." button. The program will open a new window showing the background currently in charge. After the background has been subtracted (or not subtracted if the low-pass filter has zero-width), the image undergoes a gain and offset pass. The gray-level of each pixel (which is represented as a floating-point number between 0.0 and 1.0 - black and white) is first multiplied by the specified gain (default 1.0) and then offset by the specified offset (default 0.0). If any underflow (less than 0.0) or overflow (more than 1.0) occurs, the underflow and overflow markers will be lit, and the pixel values in the output image are limited to be between 0.0 and 1.0 anyways. The "Display original image" check-button can be used to disable and re-enable image operations on the on-screen image. To ease people who performs repeated experiments, the program includes two buttons called "Save parameters" and "Load parameters". The region of interest and acquisition parameters are always saved to the same file, so the user is not allowed to "Save As" a different name. The parameters are saved to file called ".pxc_xgrabrc" in the user's home directory). The frame rate is represented by an integer number, that reads as "save one frame every that many frames". To ease the user the rate is also expressed as time between successive acquisitions (for PAL cameras that value is a multiple of 40ms). The duration of acquisition is expressed in seconds. The "Directory name for sequence" value is the name of a directory, where the program will save acquired images as a collection of independent pgm files called sequence.NNN, and acquisition parameters (calibration and frame rate) as a file called params. Even though the program suggests an experiment name, you are free to replace the name; the program will take care of choosing a new name for every acquisition run, using your suggested name as an hint. A simple live-video application. It uses either the "pacco" tool (a GPL package, available from ftp://ftp.linux.it/pub/People/rubini or the photo widget of tk (the photo widget is slower). Part of this code is contributed by Daniel Scharstein. The device being used is retrieved from the command line, from the environment variable PXCDEVICE or defaults to /dev/pxc0pgm. Both pgm and ppm devices do work. The program can also control some camera parameters, using knobs laid out in an optional window, activated by the More... button. The tool is so silly and unrelated to the driver that it isn't installed by "make install".